The 10.2 MW plant started operations end of 2018 and has now been officially inaugurated. Currently, innogy is also working on the first Irish offshore wind farm, a 600MW project located in the Irish Sea, off the coast of Dublin. 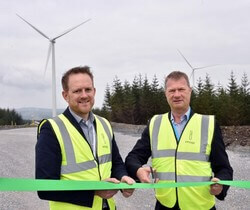 Therefor, they have teamed up with Irish company Saorgus Energy. The partners are currently undertaking technical studies to further progress the development through to planning consent.